A range of multi-channel PCI-Bus Digital Input/Output cards, uses include factory/laboratory/industrial automation, communication switching. The DIO-144/96 provides 144/96 TTL digital I/O lines. ISA Bus. PCI Digital I/O card with 16 optically isolated inputs and 16 open collector outputs. It can be installed in a 5V PCI slot and supports "Plug & Play". PCI Digital I/O Card with 16 optically isolated inputs and 16 PhotoMOS Relay outputs. It can be installed in a 5V PCI slot and supports "Plug & Play". PCI Digital I/O Card with 16 optically isolated inputs and 16 electro-mechanical Relay outputs (8x Form C - SPDT, 8x Form A - SPST). It can be installed in a 5V PCI slot and supports "Plug & Play". PCI Digital I/O Card with 8 optically isolated inputs and 8 electro-mechanical Relay outputs (4x Form C - SPDT, 4x Form A - SPST). It can be installed in a 5V PCI slot and supports "Plug & Play". PCI Counter/Timer and Digital I/O Card with12 channels of 16-bit counter/timer. Two internal clock sources (8M / 1.6M and 0.8M / 80K) are selected by jumper. This card can be installed in a 32-bit 5 V PCI bus and can support "Plug & Play". Universal PCI Digital I/O card providing 168 TTL digital I/O lines, consisting of twenty-one 8-bit bi-direction ports. Universal PCI Digital I/O card providing 24 TTL digital I/O lines, consisting of three 8-bit bi-direction ports. Universal PCI Digital I/O card providing 48 TTL digital I/O lines, consisting of six 8-bit bi-direction ports. Universal PCI Digital I/O card providing 24 TTL digital I/O lines, consisting of three 8-bit bi-direction ports. Additionally the PIO-D56U includes an extra 16 Digital Input and 16 Digital Output channels. Universal PCI Digital I/O Card providing 32 digital input channels, 32 output channels and 6 counter/ timer channels. The board consists of two 16-bit input ports and two 16-bit output ports. Universal PCI Digital I/O card providing 96 TTL digital I/O lines, consisting of twelve 8-bit bi-direction ports. The 8-bit ports are named port A (PA), port B (PB), port C (PC) with all ports being configured as inputs upon power-up or reset. PCI Digital Output Card, Optically Isolated, 64-channel Open Collector (current sourcing). Universal PCI Digital Output Card, Optically Isolated, 64-channel Open Collector (current sinking). PCI Express 16-channel Isolated Digital Input and 16-channel Relay Output Card. Universal PCI Digital I/O card with 32 channels of optically isolated digital inputs and 32 channels of optically isolated (current sourcing) digital outputs, arranged into four isolated banks. Universal PCI Digital I/O Card with 32 channels of optically isolated digital inputs and 32 channels of optically isolated (current sinking) digital outputs, arranged into four isolated banks. Universal PCI Optically Isolated Digital input card with 64 channels of optically isolated digital inputs, arranged into four banks. 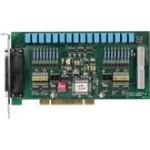 Universal PCI 8 channel Isolated Digital Input and 8 channel (Form A - SPST) Relay output card.